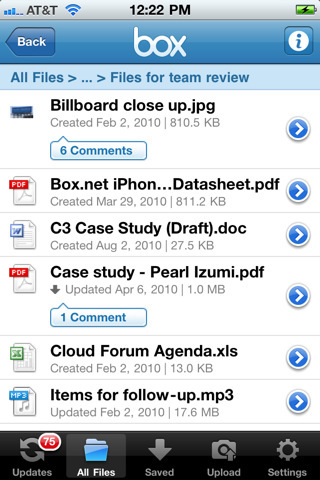 Use the Box.net app to upload your files and share them with others on your iPhone or iPad. Box.net offers a free personal account which gives you the ability to store up to 5GB of files on the cloud. You can pay for higher end services and storage with the expanded, business or even enterprise level accounts. The box.net desktop sync app is not available for the free users. You must be a paying customer to get that functionality. For a competing service and iPhone app be sure to also look at the DropBox app. Once you log into your Box.net account, you have 5 tabs in the app. You can view All Files, Saved files, Upload new files, view Updates, and edit Settings. To upload files from your iPhone, you can either pick photos from your library or take a new picture and upload it. Pictures are uploaded at full size and resolution. Uploaded images are sent to the Box.net folder that you have actively selected in the All Files tab. You can’t create new folders from within the app however. When you open a file, Box.net at first requires a network connection. Once open you can choose to save any file for offline viewing, which gets stored under the Saved tab. You can share any file or folder with friends by email from this app. To do this just tap the “i” icon and choose share. Enter an email address and an optional message to share the file(s). The app sends out an email with a web link containing your shared files. The updates tab shows any new files that you’ve uploaded since you last opened the Box.net app. You can hit the refresh button to manually pull in the latest file uploads. There is also a refresh button in the All Files tab. During our tests we noticed the app won’t show the newly uploaded files in the All Files tab showed unless you manually force quit the Box.net iPhone app and open it back up again. The app has a few different settings. You can enable a caching option which stores recent files locally for later viewing. If you have sensitive information on your Box.net account, you can enable the Passcode lock feature in the settings. The app supports AirPrint and single sign-on for using either your Google or PingFederate account. You can open and view Office files (Word, Excel, PowerPoint) PDFs, images, audio files, and videos. On the iPad you can output your videos or PowerPoint presentations to an LCD monitor using the iPad Dock Connector to VGA Adapter. As of right now you can’t create new folders, and you can’t delete files from the iPhone app. 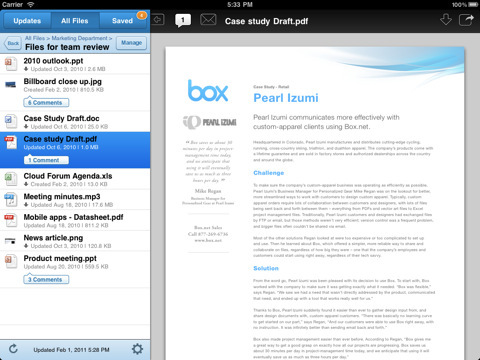 on the iPad version of Box.net app you can actually edit files, even files from other apps. Overall, Box.net is a free app to support the Box.net cloud storage service. The app is great for sharing files or folders with friends and colleagues, and its support for commenting and editing on the iPad make it a very good alternative to other document management apps. AppSafari review of Box.net was written by Joe Seifi on July 31st, 2010 and categorized under App Store, Files, Portals, Social. Page viewed 4997 times, 1 so far today. Need help on using these apps? Please read the Help Page.